Recipes that have a history always have an appeal. Don’t we treasure the recipes of our grandmothers and mothers and proudly call them “family recipes”? Each one of us have a treasure trove of family recipes which we pass on to the next generation with great pride. These recipes are precious and need to be preserved. Recently I came across a recipe – Grandma Margery’s Egg lessChocolate Cake. I loved the fact that it is a family recipe. And the fact that it is egg less turned out to be a bonus. I baked this cake with some changes. I used whole wheat flour. I did not have chocolate chips. I used chocolate chunks instead. The cake was delish. It was moist and full of chocolate chunks. It tasted great on the second day. I baked the cake in a regular square tin and one very small one in a bowl for my daughter to take to school. 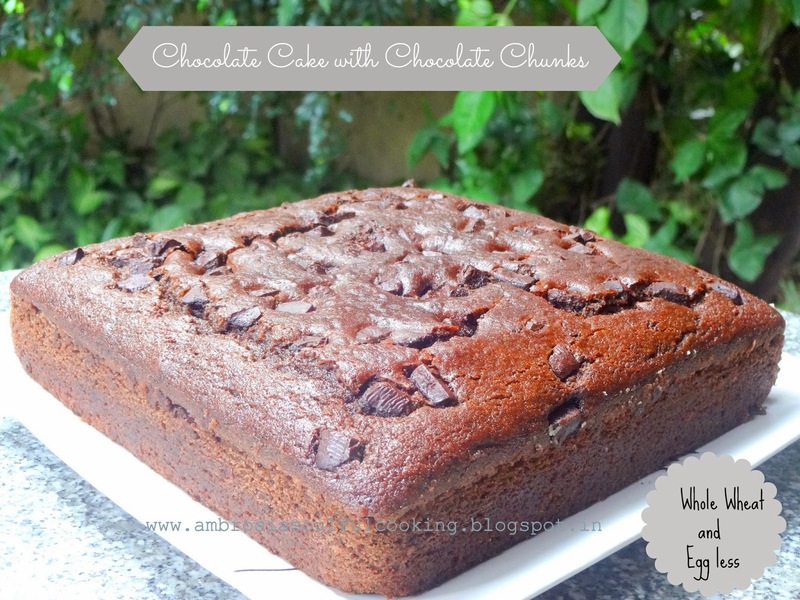 1/3 cup chocolate chunks (chop two dark chocolate slabs into small pieces) or chocolate chips. * if you do not have buttermilk, take 1 cup of milk, add 1 tablespoon of lemon juice or white vinegar and stir. Let it stand for 15 minutes. Use. Preheat oven to 200 degrees C. Grease and line one 7 ½ inch x 7 ½ inch square cake pan. Whisk together whole wheat flour, salt, baking powder, baking soda and sifted cocoa powder. Take butter and sugar in a big size steel bowl. Add boiling water and cover for 5 minutes. Stir till sugar dissolves. Add vanilla extract. Add buttermilk. Add dry ingredients to wet ingredients and mix till well incorporated. Do not over mix. Fold in chocolate chunks/chocolate chips. Reserve some to sprinkle on top. Pour the mixture into the prepared cake tin. Sprinkle remaining chocolate chunks/chips. Bake at 200 degrees C for 12 minutes. Lower the temperature to 180 degrees C and bake for another 45 to 50 minutes or till a toothpick inserted in the center comes out clean. Remove from the oven and remove from the pan after 5 minutes. Cool in the rack. Slice next day. Hi Namita, thanks for this recipe. I baked it on Saturday. Its supper yum..I have taken pics and was wondering how can I share them with you. I followed the recipe by using dark chocolate which is less sweet. Baked ina bundt pan. Hi.. Tried your cake.. it was sooper yummy.. loved the texture.. thank you so much for the recipe..Its a keeper for sure..
Hello Maanasa, I am happy that you tried my recipe. Hope you try out other recipes also. Hi Namita, am so keen to try this cake. Just a small doubt..can we replace butter with oil? If yes what's the qty of oil to be used? Hello Priya, Thanks for writing to me. Please go ahead with oil/coconut oil. It works well. Quantity will however remain the same. Hope you enjoy baking this cake. 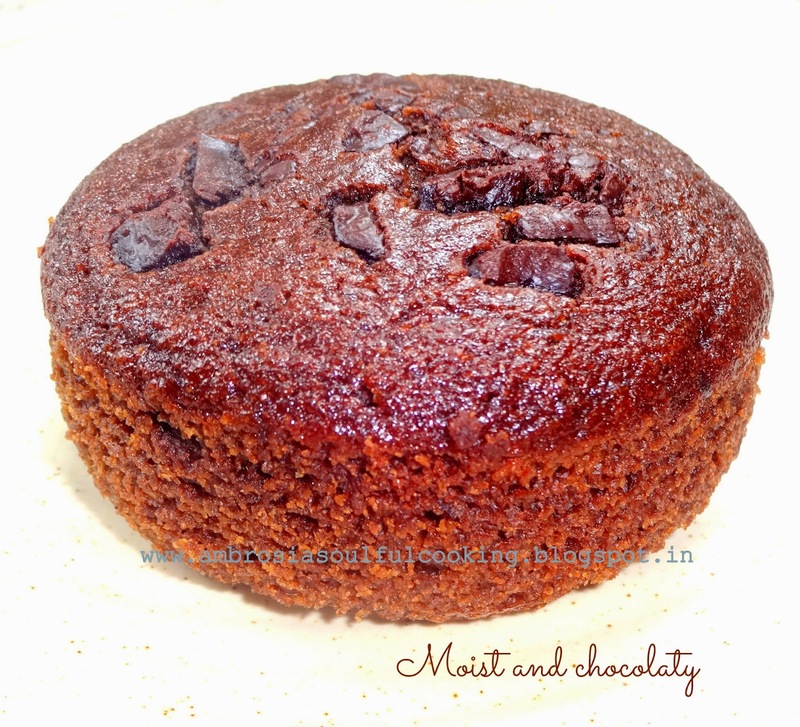 Hi Namita this recipe is superb..just 1 question if I am using round mould which size should I use? Hello Garima, You may use 8 inch round cake pan. Happy Baking! What is the cup size you used ? Hello! I use the standard 240 ml cup. The cake was so soft and fluffy. It was hard for everyone to believe that it was not apf but wwf. Thank you so much for such a wonderful recipe. Loved it. Hello Radina, I am so happy that you visited my blog and tried this recipe. Thank you so much for your feedback. Hope you try out some more recipes from my blog. Hello Meenakshi, I am happy that you baked this cake and happier that you all liked it. This cake is best enjoyed next day. If you are planning to keep it for two days, pls keep in refrigerator. Cakes with buttermilk or yogurt tend to spoil faster. 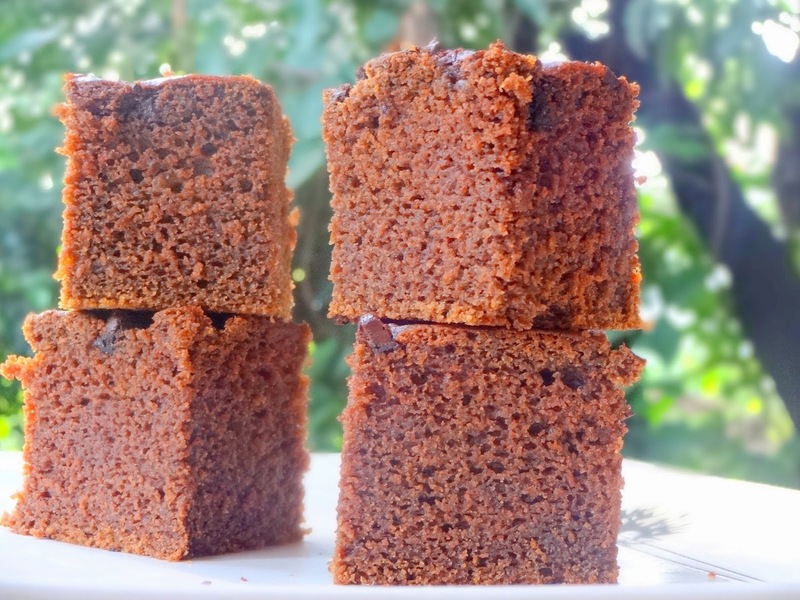 Hi Namita, loved this cake recipe. I just wanted to ask if i can replace cocoa with wheat flour to make a vanilla cake? Yes, Ramya, you may replace cocoa with whole wheat flour.We are uisng 1/2 cup cocoa in the recipe. Replace it with 1/4 cup flour. Wheat flour is heavy. You may need more water. Hope you enjoy baking this cake. 1 stick buttr means?..is thin curd equivalent to buttermilk? can i skip choc chunks? Hello Kritika, 1 stick butter is the regular 100 grams butter available in the market. If you have thin curd, whisk it till smooth. It would work fine. Yes, you can skip chocolate chunks. You can add walnuts if you wish. 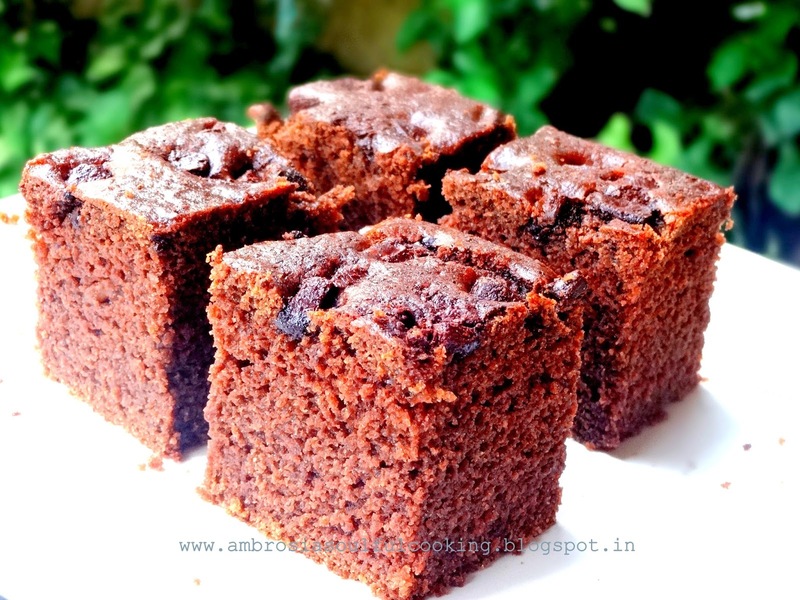 This is our go to recipe for doing charity bakes in Pune . The kids love it .... Thank you ! Hello Anagha, So happy to know about the charity bakes. Thank you so much.